A scene from Black Mirror: An armed man chases a woman while onlookers capture it on their smart phones. 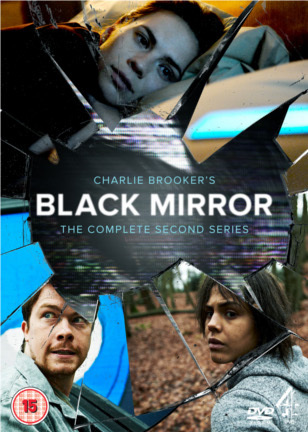 Black Mirror is just one of several recent examples in which popular culture is attempting to deal with these anxieties about digital media. Her, the recent Oscar winner for best original screenplay, imagines a similar time in the not-too-distant future where people develop emotional attachments to their personal operating systems. Additionally, filmmaker Godfrey Reggio, who 30 years ago created the jeremiad-laden film Koyaanisqatsi, returns this year with Visitors, a film that is attracting attention for its long takes of people starring, as if transfixed, into the presumable screens of the TV, computer or game console. In addition, numerous articles (here and here) have appeared recently about people deciding to do “media fasts” or to take a break from certain forms of media. And as the Christian season of Lent begins, you can expect many of your Facebook friends to “give up” checking their page during the 40-day period of fasting in preparation for Easter. Social media, in particular, has become less important to people’s lives. A recent Pew study showed that social media was the form of media that Americans felt that they could give up most easily. A scene from the film, Visitors. Considering that people are talking about and reflecting on these issues in popular culture points to the fact that there are real anxieties about digital technologies and how they are impacting individuals and society. Obviously, this anxiety is nothing new; we have always been worried about new technologies. Unique concerns are arising relating to the specific affordances of the media technologies, and these concerns are often played out in the spaces of media and culture, specifically the genre of science fiction. Science fiction has always been a playful space where we can imagine how new technologies might impact our society. The best science fiction, in my opinion, uses a space that is quite familiar but different enough that we can explore these various issues. Science fiction can also allow us the space to critique or atone for past mistakes—think how science fiction has dealt with topics like colonization or occupation. Her and Black Mirror are two great examples of familiar future worlds (with the exception of the high-waisted pants in Her) that imagine what would change with these new and different technologies. While neither of these examples addresses specific religious issues, they contain strong appeals to moral and ethical concerns. Ultimately, how are these new technologies impacting how we treat each other and how we form our societal values? First, science fiction often deals with issues of consciousness and what makes a human being. This is one of the main themes of Her since people are forming connections with their operating systems that mimic real human connections. The operating systems do not have bodies, but do they have a consciousness? Can they feel true emotions? Are their connections with humans authentic? Is it possible for a single OS to have the potential to truly love thousands of people in a God-like manner? Her doesn’t propose answers to these questions, but rather challenges our understanding of the limits of consciousness, and possibly our understanding of the divine. If operating systems can know more than we can ever imagine, then how does that impact a belief in an all-knowing divinity? An episode of Black Mirror pushes this idea further. In the episode, (minor plot spoilers ahead) a young man is killed in a car accident, leaving his partner behind. The grieving partner hears about a new technology that will allow her to recreate her partner virtually through all of the information that he shared through social networks and online. She recreates a digital copy of her partner based on his online profile, and obvious challenges ensue when she realizes that his online profile is not representative of his true consciousness. This episode brings up questions of whether our consciousness is just a bunch of data or if there is something deeper there, such as a soul. It also raises concerns that are common in science fiction around using technologies to “play God” and create human life. But in both of these cases, something is always found lacking in the created life. In Her the operating systems are very empathetic, but they do not have physical bodies or a sense of the fragility of human life. In Black Mirror, the recreated dead boyfriend is able to have a body (maybe this could be the sequel to Her?) but he lacks intimacy and vulnerability since those are not traits that he exposed online. Because of these deficits, the artificial consciousnesses are not always treated as equally human and their needs are not always met by the “real” human characters, which brings up more moral concerns of how we are to treat artificial intelligence. Another main theme in recent science fiction is how new technologies are distracting us from social engagement. Her features many scenes of Theodore, the main character, walking around the city, conversing with his operating system, while everyone he passes are also talking to their OS. It strikes me that the characters in Her were not simply distracted or disconnected from others, but rather that they were incredibly lonely. When Theodore is alone at home, he resorts to digital technology to starve off lonely feelings, but when he is with friends or coworkers, he is present and connected. I don’t get a sense, watching this film, that the people in this future world have lost their ability to talk with others or express compassion. On the other hand, there is a lingering anxiety about staring at a screen and what this is doing to us as humans and how we connect to others, which Reggio attempts to explore in Visitors. In fact, the meaning of the title of Black Mirror refers to the screens that we stare into day in and day out, which never reflect back our own image and which we rarely reflect upon their use in our lives. One episode of Black Mirror features this boarding school or institution-like space where participants compete in computer games, but they live in a room that is made up of wall-to-wall screens. So in the morning, a digital sun will rise on their screen to wake up the participants, and in their free time, they can watch a TV program or play a game on the screens. They are literally surrounded by screens at all times. In another episode, a new technology is invented that allows people to replay past memories and experiences. With this new “memory chip,” people become obsessed with re-watching moments from their lives, so that even one’s own life is viewed through a screen. These two episodes are also an example of how the new technologies can become almost God-like in the way that they monitor our every action and keep accounts of our lives. People consent to joining this screen-saturated institution or to having a memory chip implanted partly as a way to improve their lives. The belief is that the technologies might hold people more accountable for their behaviors. 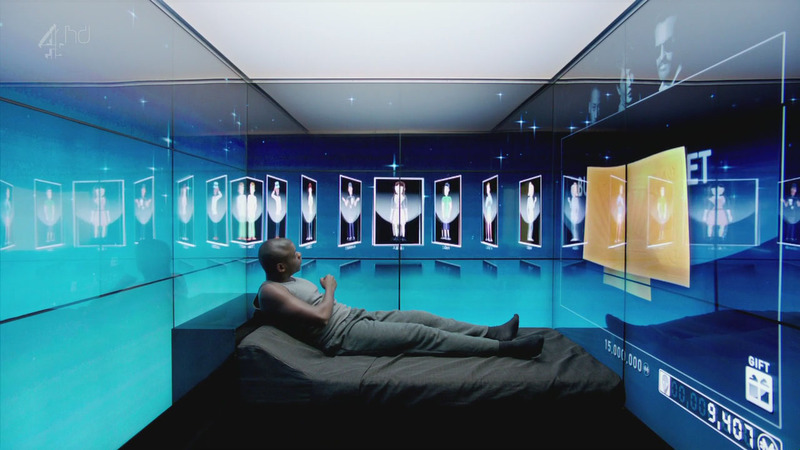 A scene from Black Mirror in which the character lives in a screen-filled room. Another important theme that is prevalent in Black Mirror is that the media are viewed as holding some sort of centralizing role in society. Nick Couldry discusses this as the “myth of the mediated centre” because the media defend their role as holding symbolic power for the whole society. If a person wants to participate in something larger than her ordinary life, she must be present in the media or have her narrative present in the media in order to truly be a part of society. In the Black Mirror episode that deals with the screen-saturated institution, participants are actually competing and working to earn points. These points are used for basic necessities and entertainment, but for those individuals who can save up points, they have the chance to audition for an American Idol-type show. Getting to participate in the contest show is not a guarantee that they will become famous or that they won’t be taken advantage of, but the participants continue to do the labor in the institution for the chance to be present in the media. They desire to be a part of the “media centre,” if only for a moment. It’s not clear where all of this anxiety over digital media is coming from or if these concerns are different from previous fears over other media technologies, but science fiction does allow us the space to test out these new technological possibilities and to imagine this future, best or worst case scenarios. We are asking questions about human consciousness, morality, and how we treat each other. There are growing concerns about our social interactions in the digital space and how authentic we are presenting ourselves to others. It is fascinating that in the Pew survey, the majority of Americans would be most willing to give up social media, causing us to question whether forms of social media are really connecting us socially or instead distracting us from each other. This isn’t to say that the media inevitably make social interactions less authentic, but rather that people are finding these moments of interactions in other ways, and some ways are still through digital technologies. It is unlikely that we are going to stop staring into our black mirrors anytime soon, but we will continue to see the proliferation of moments of stepping away (digital detoxes, media-free retreats) and these cultural moments of reflection on how digital media impact us morally and socially. 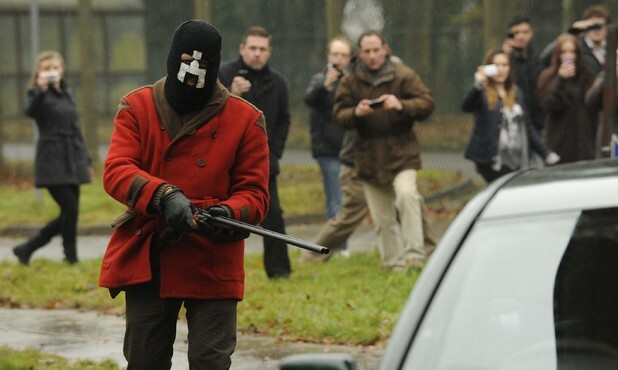 For a more detailed discussion of Black Mirror, read Andy Greenwald’s piece in Grantland. social media now is different. There is actors must be a flexible and to perform roles professionally. In modern films such as https://viooz4k.net/adventure/ has these moments.